Getting your kids involved in cooking can be fun, if they are old enough to clean up their messes. I gave my 15 year old daughter the other night full access to the kitchen to make dinner for our family, if she cleaned up her mess. She came up with, Claudia's Tofu Orzo. This dish is simple, yummy and becoming a family favorite. 1 container of firm tofu, cut into small chunks. Cook your Orzo according to the package, drain and set aside. In a non stick skillet heat up your olive oil on medium high heat. Add your tofu, let the tofu cook for 3 minutes stirring occasionally. Add a couple of dashes of soy sauce to your tofu and let cook another 3 minutes. Repeat this process with the soy sauce. Add a generous amount of your dried Italian seasoning to your tofu, mix well. 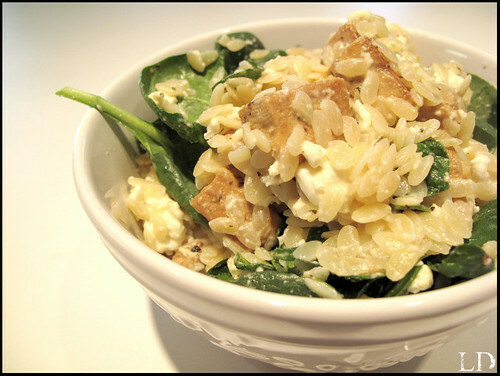 Add your orzo pasta and cooked tofu into a large bowl, mixing in your feta and spinach. Serve warm or cold. Mmmm - this looks delish! Claudia you are so creative! Following in Mom's footsteps :) I'll definitely have to try this one. Thanks for sharing!